Star Fox 64 was originally released for the Nintendo 64 on June 30, 1997. Star Fox 64 was re-released on the Wii's Virtual Console service in North America on April 2, 2007 with a price point of 1,000 Wii Points, which is $10. The original N64 game was rated "K-A" by the ESRB, which meant the game was for "KIDS TO ADULTS". The Virtual Console version received the updated ESRB rating of "Everyone" with "Violence" listed at the only content for gamers/parents to be aware of. If you are a Nintendo 3DS owner, Nintendo is releasing Star Fox 64 3D tomorrow, September 9, for the system. The 3DS version of Star Fox 64 has a MSRP of $39.99, and features updated graphics and two control methods, one which uses the 3DS' gyroscopes, and it features local multiplayer across 3DS systems. So, with Star Fox 64 3D releasing this week, how many hours Wii owners have played the Virtual Console version of Star Fox 64; and do the reported hours show Star Fox 64 3D might be worth its $40 asking price, or would gamers be better off purchasing the cheaper Virtual Console version for just $10? Let's take a look! 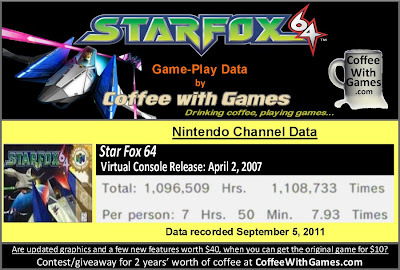 Star Fox 64 has about 139,815 Wii owners that have reported game-play hours through the Wii's Nintendo Channel, with 1,617 days of data possibly reported. 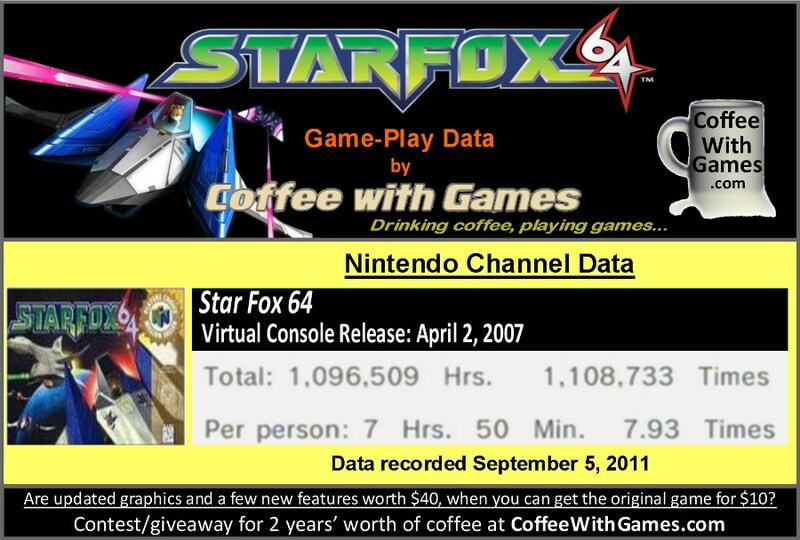 Star Fox 64 has 1,096,509 Total Hours of game-play reported, with its average play-time being 7 Hours 50 Minutes "Per person"(or console) reporting data. The game's average play-time is about 59 minutes per day/session reported. Star Fox 64 is not currently listed in the Virtual Console's "Popular Titles" section, as of checking around 5:45PM on September 8, 2011. The "Popular Titles" section lists the current top 20 most popular(or purchased) Virtual Console games. Star Fox 64's Virtual Console version in the United States has made Nintendo about $1,398,150(before taxes) though, just based on the approximate number of players that have reported data and the game's $10 price point. Star Fox 64's, the original N64 release, "professional" review score average is 89.87%, based on 14 reviews on GameRankings.com. The game has a 4.5 out of 5 Stars rating on Amazon.com, based on 90 customer reviews between two versions of the game. Star Fox 64's customer review score average is 87.77%, when the reviews are converted to a 100% review scale. I played Star Fox 64 with one of my cousins back in the 90s. He owned the game, and I can remember playing through several of the levels and really enjoying the game. I also remember my cousin and me playing the game's multiplayer, and he would usually easily defeat me. As for the reported game-play data, I think nearly 8 hours of game-play is pretty good for $10, and it actually makes me want to put Star Fox 64 on my list of Virtual Console games to purchase; but if the 3DS version of Star Fox 64 is basically the same exact game, I am guessing the game-play length is going to be the same, and I don't see how I could justify spending $40 on it. Why Nintendo did not spend time adding an online multiplayer aspect to the 3DS version, even something small such as a leaderboard element, really baffles me; but I think it shows a greater problem at Nintendo right now with its online infrastructure and programming. Have any of you played Star Fox 64, either the original version or the Virtual Console version? If so, what did you think about the game? Do any of you think Star Fox 64 3D is overpriced at $40, based off the average play-time hours of Star Fox 64 on the Virtual Console, or if you own a Nintendo 3DS is Star Fox 64 3D a game you are looking forward to purchasing soon? Haven't played the original, or own a 3DS for that matter. Frankly, the 3DS Star Fox needed online play. I think the 3D will really help this game, and might still be worth buying over the Wii game, but a visual update isn't really enough to make a "great game." Online deathmatches would have been a must have. I think having the poor camera resolution without online play is a serious oversight. I think online play should have been added. I'll be getting the game after I get my haircut tomorrow for sure regardless. I love Star Fox. I played the original star fox when it came out. A buddy of mine bought it, and he came over and we spent the weekend eating pizza, drinking mt. dew and playing through the game a handful of times - it was a lot of fun. I am curious to see how the new 3DS version looks and plays. I wouldn't say $40's overpriced since that's kind of the going rate for these games right now, but it may not prove to be the best value. Games like this tend to be short-lived with me simply because I tend to beat them so quickly. I remember in the summer before I went to 11th grade, I worked at Walmart and on my breaks I would go into the Electronics section and just play this game. And as well as after my shift. It was a really fun game and at the time the graphics were beyond awesome. Haha! I guess it's my extremely cheap nature coming out, in that I don't see how updated graphics, with no online play in 2011 is reasonable at $40. Like you though, I don't own a 3DS(waiting on that redesign now! ), but I think these type of games should be below the MSRP of $40. Online play, or at least online leaderboards...again, 2011 and the 3DS firmware isn't up-to-date with the "non-competitor", as some people say, of the iPod Touch and iPhones. Do you own Star Fox 64 on the Virtual Console as well? Anyway, I'll be keeping an eye out for your review of the game! "I wouldn't say $40's overpriced since that's kind of the going rate for these games right now, but it may not prove to be the best value. Games like this tend to be short-lived with me simply because I tend to beat them so quickly." Well, Sony and Microsoft(especially Sony) seem to releasing older games, but at budget prices; not the standard "new MSRP" of $59.99 on their consoles; so seeing Nintendo going this route with ports is just odd, especially with no online play... after all, I think first party titles would be the ones to show 3rd party developers what a system is capable of on all fronts. I don't think Nintendo has released an online 3DS game yet have they(somebody correct me please!)? Would you play the "hover and wait" game, if there were young children on it, that didn't know "how" to play it? Like stick around for a minute, then after they were repeatedly failing say, "HERE! Let me show you it's done!" Thank you all for the comments/feedback so far! If anybody else has feedback on the 3DS version if you have played it, hop on in the conversation and let us know what you think about it. No online games that I'm aware of - no, and that does seem like quite the missed opportunity. And that's a good point, how many re-released games are getting put out at about 66% price of true 'new releases'. It doesn't really bother me if the game has a lengthy playtime, but for something that's shorter to beat, it is a bit of a bummer - and probably makes it a good candidate to be found cheaply and in high quantity in the used game market sooner than later. Never played it back in the day and have looked at the 3DS version, but am not sure on the price. Even though all new 3ds titles seem to be at $40, online multiplayer would make a big difference.